Welcome to what was once the Fitchburg Furnace Community--a bustling settlement that made its living from the iron and wood resources of these mountains. Fitchburg had mills, shops, and homes for more than 100 families, all engaged in the smelting of iron ore.
Fitchburg Furnace, reputedly the largest of its type in the world, was designed by Fred Fitch and construction was completed by Sam Worthley in 1869. Known as the Red River Furnace, this structure represents the first attempt at improved furnace construction in this region. The twin stacks, named Blackstone and Chandler, were built in a solid rectangular mass of sandstone, with a 40 x 80 foot base and 60 feet high. The stacks are 50 feet high and 12.5 feet across inside. The furnace used a steam powered air blast and charcoal for fuel. The combined stacks had a capacity of 25 tons of pig iron per day, producing over 16,000 tons before it closed down in 1873. The cost of the furnace, without machinery and steam engines, was over 100,000 dollars, while the machinery and fittings brought the total cost to nearly 160,000 dollars. only briefly and began a swift decline during the great financial panic of 1873, caused by over-speculation in western railroads. Since most of the iron smelted in this furnace was for the production of car wheels and rails for railroad construction, production slowed down for lack of markets. The final blow, however, was the discovery of the rich iron ore beds in the Birmingham District of Alabama. Since this ore was of better quality and much more easily accessible than this area, competition was impractical, spelling the death of the local iron industry. Little by little, the fires in the old furnace flickered out, never to blaze again. Thus writing the final entry in the journal of the iron-making industry at Fitchburg. Fitchburg Furnace, once the scene of a bustling iron industry, now stands silent. Where long ago fire belched out of the stone chimneys, moss has now taken root. The shouts of the iron workers have given way the cries of birds and insects. The old furnace had its day and then faded into long years of oblivion, awakening as a modern-day attraction. The U.S. Forest Service acquired the Fitchburg Furnace on April 6, 1973 as a donation from Joyce Russell Broaddus and Toska Russell Middleton. On April 17, 1974, the Fitchburg Furnace was listed on the National Register of Historic Places. 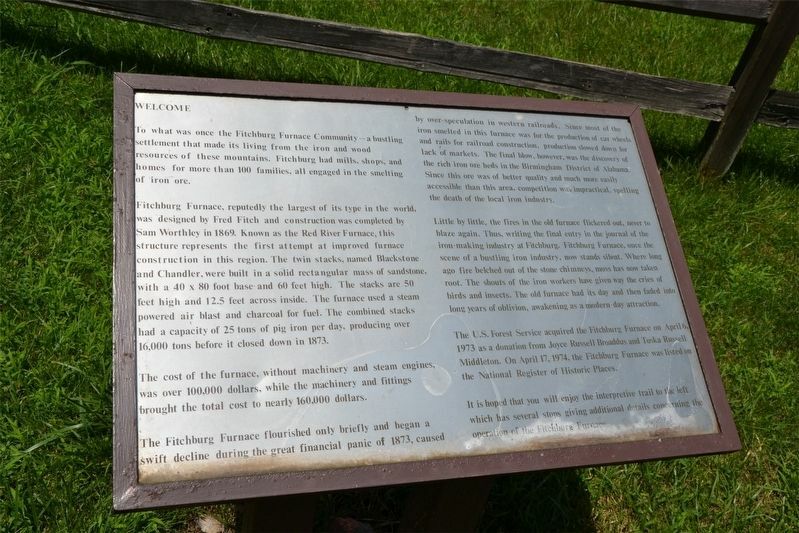 It is hoped that you will enjoy the interpretive trail to the left which has several stops giving additional details concerning the operation of the Fitchburg Furnace. Location. 37° 43.993′ N, 83° 51.147′ W. Marker is in Fitchburg, Kentucky, in Estill County. Marker can be reached from Fitchburg Road 3.1 miles north of Kentucky Route 52. Touch for map. Marker is in this post office area: Ravenna KY 40472, United States of America. Touch for directions. Other nearby markers. At least 8 other markers are within 10 miles of this marker, measured as the crow flies. A different marker also named Fitchburg Furnace (here, next to this marker); a different marker also named Fitchburg Furnace (a few steps from this marker); a different marker also named Fitchburg Furnace (within shouting distance of this marker); a different marker also named Fitchburg Furnace (within shouting distance of this marker); Woody Stephens and Forty Niner (approx. 8.3 miles away); County Named, 1852 (approx. 8.3 miles away); Courthouse Burned (approx. 8.3 miles away); Collecting Red River's History (approx. 9.6 miles away). Touch for a list and map of all markers in Fitchburg. Regarding Fitchburg Furnace. 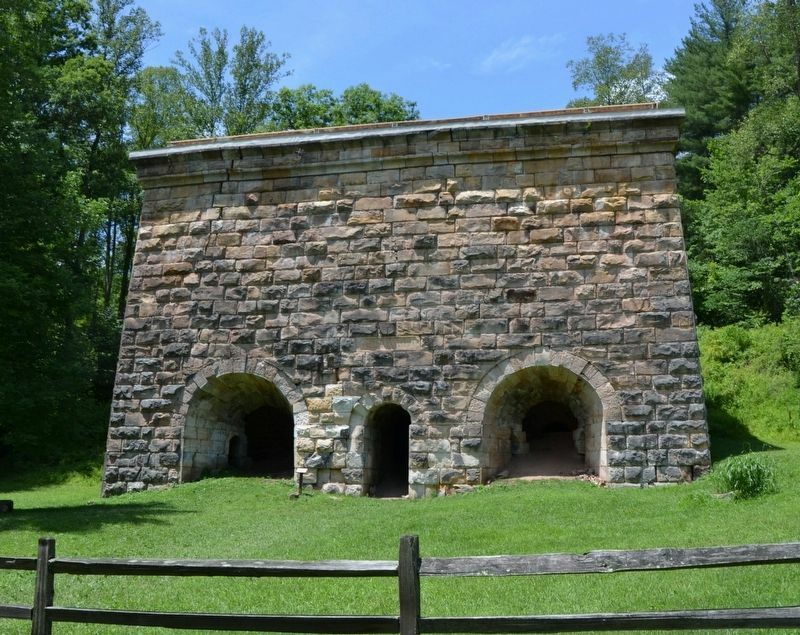 Red River Iron Furnace is #74000860 on the National Register of Historic Places. More. Search the internet for Fitchburg Furnace. Credits. This page was last revised on April 1, 2019. This page originally submitted on March 30, 2019. This page has been viewed 84 times since then. Photos: 1, 2. submitted on March 30, 2019. • Bill Pfingsten was the editor who published this page.